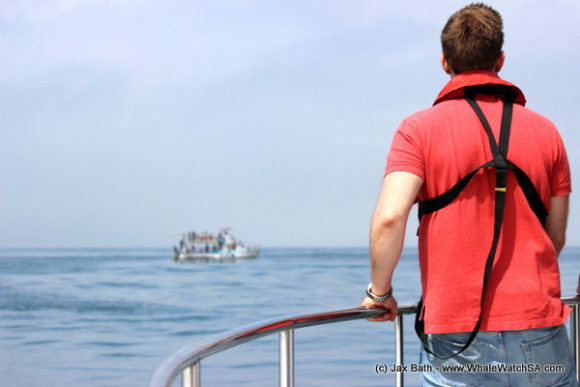 It was a beautiful day to be out on the water with a little mist behind the island, a flat sea and the absolute perfect temperature for an Eco tour. 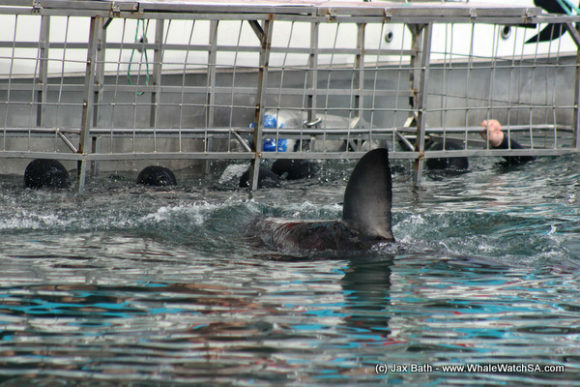 Our first sighting was at our sister company’s shark cage diving vessel, Slashfin. 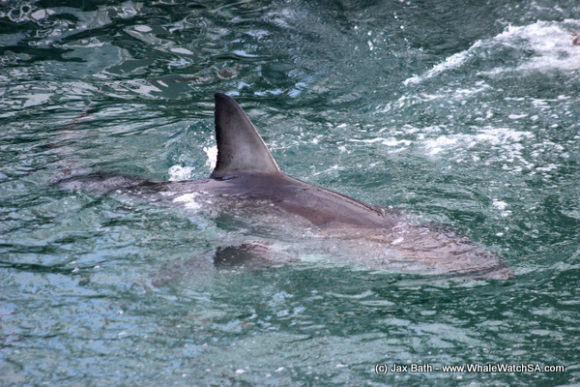 Here we found a small, energetic Great White Shark who came up for the bait numerous times, exposing his exceptionally “clean” dorsal fin. Often times, the smaller White Sharks tend to be more active due to the fact that their primary food source is small fish (which tend to move quite fast). 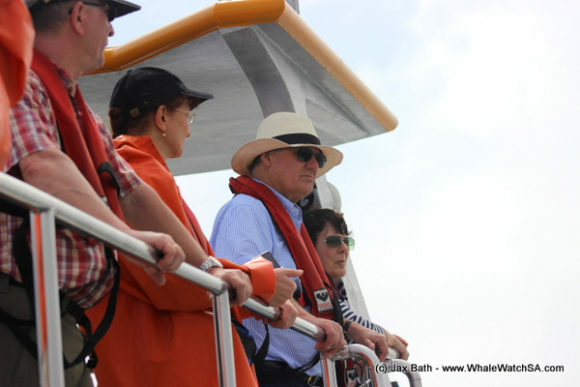 After this we head towards Dyer Island to go and see our seabirds. 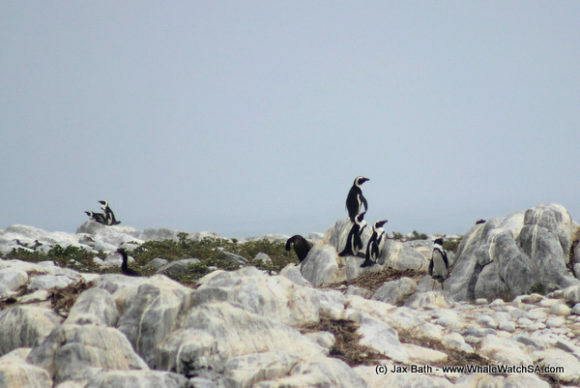 We were lucky enough to have quite a few African Penguins in sight, most of them sitting on top of the guano-covered boulders we find close to the edge of the island. It’s hard to believe that the guano (bird droppings) once stood over 2M tall on the island as it is now just a white layer on top of the rocks. This, due to us removing it for use as fertilizer for our crops and gardens. 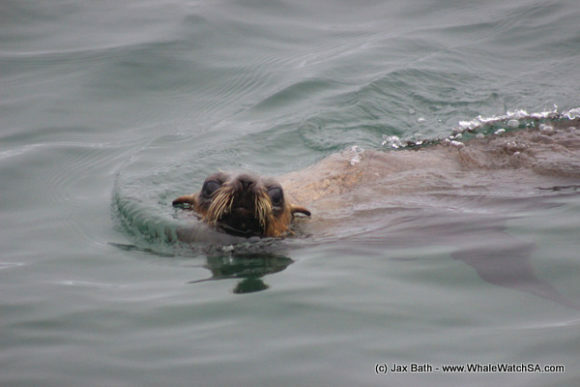 Next, we visited the seals and watched them play for a bit. 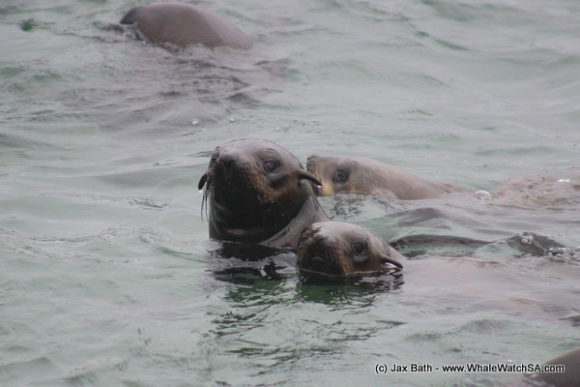 It is always nice to watch the seals individually as they are such characters, which we so often forget when looking at Geyser Rock as one large unit. 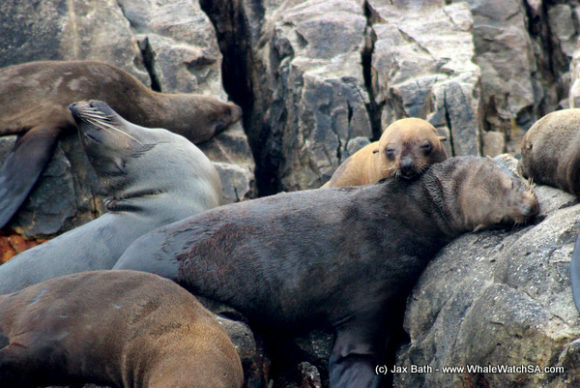 We also stopped at “Hospital Rock” today, named so because of the old fisherman fable that injured and sick seals will move there to recover from their aliments before returning to the colony. 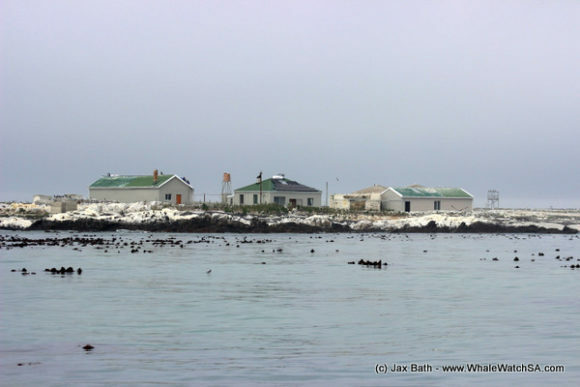 Following our visit to the seals, we head behind the island, where the red tide seems to have picked up again. 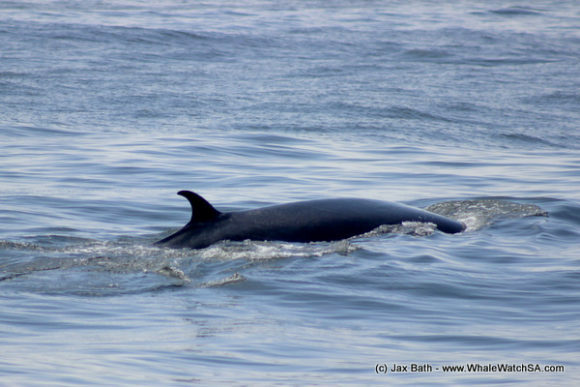 Here we were incredibly lucky to have spotted another Bryde’s Whale and her calf. 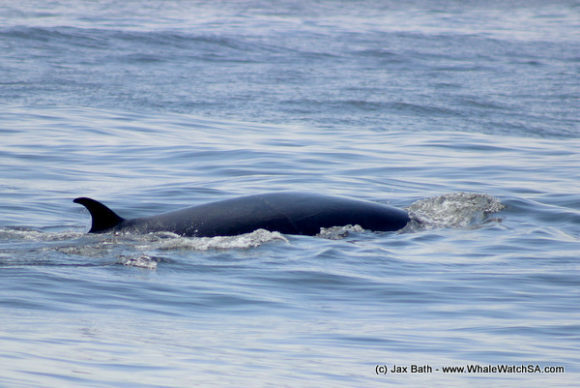 We seem to have had a lot of these pairs around lately which is absolutely awesome for there are very few thing cuter than a baby whale, especially the Bryde’s with their tiny dorsal fins. 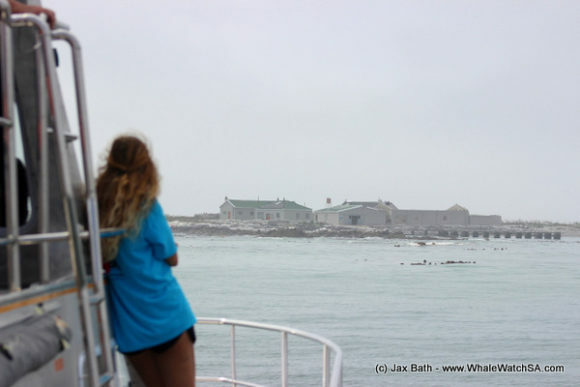 At the exact same spot, we also spotted some African Penguins and seals in the water, having 3 of the Marine Big 5 around the boat all at once. 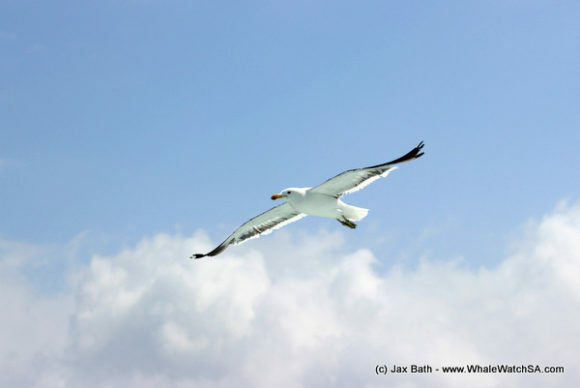 There were also a couple of cool birds around, including some Cape Gannets and a White Chinned Petrel. On the way back to the harbour we managed to spot 6 more penguins which is always a great way to end the trip.